Or are they an abomination? Or maybe a cool abomination? These are track brakes made to install onto track bikes not equipped with brake mounting holes. Made by Dia-Compe, the BRS-101 track brakes actually are standard reach-- offering 43mm to 57mm of reach....though because the actual placement of the caliper itself is somewhat flexible, that brake pad reach number loses some of its relevance. Just nice that there is wider range than available on a short reach road brake. I can't in my right mind see these as awesome additions to anybody's whip. They will undoubtedly spoil a track bike's pristeen looks. 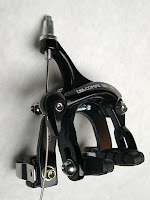 You not only have the brake caliper, but additional mounting plates and hardware. BUT if you have a brakeless track bike and your boss says "no brakes! no job! ", you have three options: get these brakes , get a new bike, or quit your job. In the interest of giving the working cyclist in that unenviable position an option, the SomaFab Shop will pick up a few of these. Keirin fans and bike geeks pay attention! 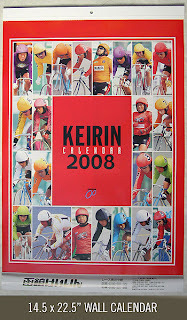 We just brought over the Pacific the official 2008 Keirin Racing Calendar! This is a full color 14.5" x 22.5" wall calendar. That is huge for a calendar to Americans, but it's kind of common in Asia. Printed on glossy poster paper. ONLY 20 of these are available. Features up close and personal photos of the best and the brightest Keirin racers in Japan. Each month gets its own page. Only Japanese holidays are highlighted in red, but heck you don't buy a calendar like this to find out when Yom Kippur is, do ya? These will be up on the SomaFab Shop next week. Price to be set then. 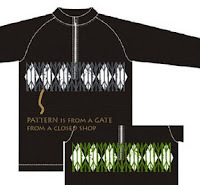 Since it is coming out so late, we cannot guarantee before Christmas arrival on these. 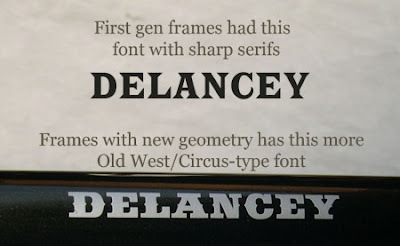 We finally have a handful of 2nd generation Delanceys going out to shops and distributors. We chose to make the 2nd gen frames the same 'Seaweed' color as the first, so we needed to devise a way for dealers and customers to easily tell which geometry they had without cracking out the tape measure. We simply changed the font of the name. Newer frames have an Old West / Circus-type font. Hopefully this will help when you stumble upon a used one a few years down the line, too. BUT if it has been re-painted (see here for a pimpin' example) we can't help you. Chain Guards - You Likey? Been thinking about chain guards. With the resurgence of interest in commuter bikes and townies, it seems chain guards aren't as taboo as they once were. The handbuilt bike show featured many minimalistic custom chainguards. Not everyone wants to roll up their pant legs each time they ride a bike. So--- is it going to become "OK" to sport chain guards/chain covers on your Double Cross? 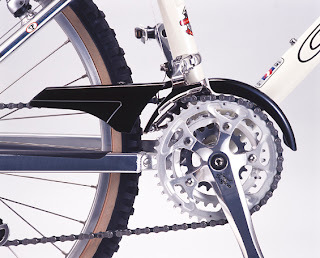 A Japanese associate of our recently turned us on to an existing two-piece chainguard which would be adaptable to most bikes with a front derailleur. 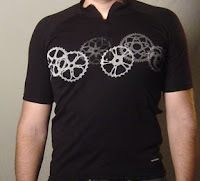 Not as elegant as a one-piece, but I don't know of an aftermarket one-piece that works with bikes with a front derailleur. Let us know if you think this is a product you'd buy or NOT buy -- and please explain why. We may bring them in for our Soma dealers or put them on our web store if there is enough interest. 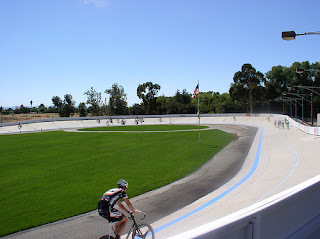 Since the velodrome's name was the inspiration for our new track-specific pedals and cranks, we thought it the least we could do is recipricate is to promote our local oval with a blurb. The Master Nationals will be held next September. The event will be conducted over six days instead of the previous five-day format. This will give each age group a day during the schedule for rest and sightseeing, and will also shorten the duration of most racing sessions. The dates for the event were chosen to avoid conflicts with the Olympics and the World Masters Road Championships. We want to stress that our own Crystal PolyPROPYLENE bottles contain no BPA. What do you think? Should Soma make a jumbo size camping bottle out of polypropylene? It won't fit your bottle cage, but you can bring it to the office or school. In conjunction with Lo-Fi Customs, we are again silk-screening graphics onto a handful of our cottony-soft TechComfort jerseys. Here are some of the designs we are considering. 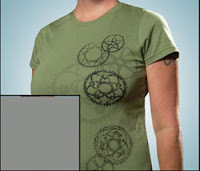 The first with the vintage chainrings across the chest is moving ahead. The other two are on the bubble. Input on these designs or your own ideas welcome. Don't you love it when you get a fat envelope in the mail? It usually is some schwag from an alley cat we sponsored or a product sample. 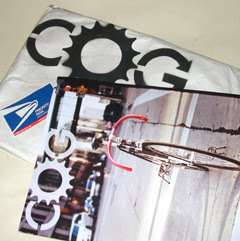 Yesterday we received the inaugaral copy of Cog Magazine (and a superbe looking t-shirt). Cog is unique in the cycling magazine world in that it is given away for free, but it isn't printed on cheesy newsprint. It is a large 9x12 format in glossy 4-color perfect for capturing the "groovy" beauty of city bike culture. This issue features coverage of the NACCC '07, the "Pisto Boom" in Tokyo and an in-depth feature on Jonny Cycles. What's our interest in a new magazine launch besides our love of reading? Kevin Sparrow, one of the editors, told us a few months back that they did a skid test on several tires and that our thick-treaded Soma Everwear came out on top. They said it did so well that in their single night of "accelerated real world testing,"the Everwear was the only tire that didn't give up the ghost before they got tired and wanted to go home. Click on image to read. With an estimated 8 billion spring water bottles worldwide NOT making it to the recycling centers in 2006 alone, there is no better time to reduce your plastic trash heap-making habit and hydrate responsibly. Need more brilliant reasons to do so? 1 )Well we are finally releasing an improved polypropylene bottle with a softer spout, so it is easier to pull open with your teeth. 2 ) Plus it IS "Green Week" on NBC! I go to the gym regularly to keep my back in shape and I get really riled when I see most people carrying Aquafina and Crystal Geyser bottles instead of a reuseable bottle. If they work out 3x a week, that adds up 156 bottles a year per gym rat. This is in the SF Bay Area where drinking straight from the tap will not turn your stomach. If you live in Texas or someplace where filtering your tap water is a must, I feel for you. But I still think using a reusable bottle is a one of the easier "green" habits all of us can adopt. 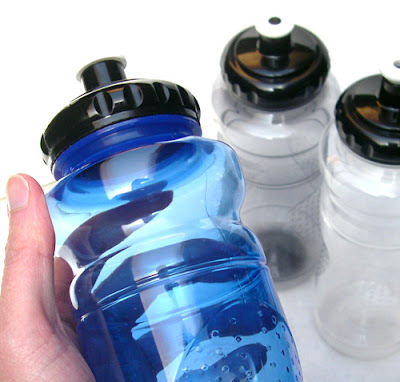 I use reusable bottles at the gym and at work and of course for cycling. The Soma bottle is still polypropylene (recycling symbol #5). It will not add a plastic taste like traditional LDPE bicycle water bottles, but it is squeezable like an LDPE (recycling symbol #4)bottle. It also has not been shown to leach bisephenol-A like the popular Lexan / polycarbonate (recycling symbol #7) camping bottles. The new 22 oz. cycling bottle is available in "smoke" and "blue" in a few days. Unlike Pepsi and other water bottlers, we are happy if you only buy 2 of our bottles per year. • Our 29er, the Juice, gets some improvements. Frame brake bosses will be removable. A new box section gusset strengthens the frame and clears any suspension fork knob. This new production will also move to 135mm hub spacing, which will make it easier to install the rear wheel. These will be available early next month in 18" and 20" sizes. Colors: Midnight Silver and Spice Red. • Oppy-X Double Toe Clips will be available soon in powder coat black, pink and white. The pink will coordinate decently with our hot pink track grips or rose pink bar tape. • Our Hemp Bags will be available in khaki green. • Our Kamisori and Ensho saddles hit the warehouse today. In October, just as we said! That's a first. These are slick looking colored saddles with a CrMo rail price instead of a Ti rail price that most colored race saddles have. • We have a Flickr page: It is mainly for posting older frame pix and Soma owner pix, but we did post a a pic of the new 650b MTB concept bike over there. • 2008 Soma Rush: We will be phasing out the Fiery Red color and introducing a Pearl White. If you think white is a little 'played out', you can still get it in black. But our new Japanese distributor, Tokyo San Esu, really wanted to see white Rushes. Downtube decals will be removable on the new stock. • 2008 Double Cross DC (i.e. "disc/canti"): We will finally be releasing a Double Cross with disc mounts. Cantilever bosses will be removable. Some of you are probably saying, "It's about time." It will be in the matte Midnight Silver that's been popular on our Juice frames. For the time being, this model will be offered in only 50 to 58cm. There will still be cantilever-only Double Crosses in 2008 --for those who don't see the need for discs-- in a full size range. • There is a brand new road frame that we plan to release mid-2008. We will release more details after evaluating our prototypes. When we were looking at names for bars last year, we began looking at names the Torrington company had used. 'Lawson' and 'Kramer' were names we were looking at. Upon further research into the names, we found out the two were contemporaries of Major Taylor. Andrew Ritchie's biography 'Major Taylor' painted talented American racers, Iver Lawson and Frank Kramer as the bitterest of rivals to Major Taylor. Supposedly there was a time Kramer, Lawson, and a third racer named McFarland tried going after him after a race. So you can see how we could not have a bar named 'Lawson Racer' in the same stable as a bar named 'Major Taylor'. As you may have heard some builders are unveiling 650b (27.5" tires) MTB prototype/concept bikes at this year's Interbike. Here is ours–currently codenamed the "B-Side". It is a steel single speed hardtail. We chose a single-speed format, because we think SS folks are a little more stoked to try something different. This was built locally and will be used for testing as well as showing at Interbike. We plan to have it displayed at premier distributor BTI's booth. No production frames are planned yet. It really depends on public response. The opportunity to explore the new platform was too easy to pass up. Tires, rims, suspension forks are being made available as we publish this. Pacenti's Neo-Moto 2.3's tires and Velocity's Blunt rims both look like winners. White Brothers forks are a proven design. Certain 26" suspension forks like Mavericks already work. If you can't find 650b tubes, 26" tubes will suffice. If we decided to pump out 50 frames, we know there will be parts to build them with. While we acknowledge most big wheel enthusiasts are too still in love with their 29ers to consider a third wheel size, from a frame designer's standpoint 650b is territory definitely worth exploring. When designing the Juice 29er frame we did notice we had to make certain 'compromises' to get things like standover height and bar height to come out reasonable. Builders will continue to have to deal with design issues as customers demand more travel. Though the 650b size is roughly in the middle between 26" and 29", we found we could use proven 26" wheel geometries, which is sweet. Chainstay length is very close to 26" wheel bikes. The 650b platform also promises stronger, lighter wheels, and other theoretical advantages over the 29er platform, but we won't open our mouth too much here until after we get in some rides on our B-Side. Soma Morning Rush Selected "Best of SF"!